Welcome to New Railway Modellers Forum. Read the Introduction and Terms and conditions of New Railway Modellers model railway forum. Introduce yourself to the members in this section. My names Jordan. I wanted to introduce myself. I used to enjoy trains and had a flying Scotsman set when i was younger on a pull out base board that was under my bed. Since then life has taken hold and I kinda lost my love for model railway, until now! I'm looking to convert my loft into my own model railway "Man Cave" if you will. im yet to get the measurements but the hatch is just off centre from my house so im thinking to start small for the time being with an end to end layout around the inside space of my loft with a view then making a layout run right around the outside of the loft. My question is, not takaing power into account as i know i will need increased power, to join the big square lets call it around the loft to my orginal end to end layout once i build it, providing i use the same gauge which im thinking 00, and provide the required amount of power, i should be ok with that right? My view is to begin with on the end to end have a station then a fiddle yard. then once i construct the outer big square, turning one end into a docks/shipping yard of some form, the other end into a loco shed, with then a join to the "Main Line" lets call it being the big square around the outer edge of the loft. Do you guys see any problems with this? I cant wait to get building again?! Location: err, down there round the corner... not that one!!! That sounds like an eminently sensible idea! Starting small and then extending will give a sense of achievement and something to play with whilst you're building the rest! As for joining boards there are various ways to do that but certainly not a problem, as long as you plan your initial end to end layout track plan with it in mind it should be fine. Anyway, welcome to the forum, and remember, here the only daft question is the one you didn't ask. "listen carefully, i shall say this only once"
Hi Jordan and welcome to the forum. The hobby is what you want to make it, and as already said the only daft question is the one that you didn't ask, so ask away. There is plenty of information to be had from a wealth of experience held by the members. flying scotsman123 wrote: That sounds like an eminently sensible idea! Starting small and then extending will give a sense of achievement and something to play with whilst you're building the rest! As for joining boards there are various ways to do that but certainly not a problem, as long as you plan your initial end to end layout track plan with it in mind it should be fine. Yeah I thought it was best to start small. I've been watching a lot of videos on YouTube, particular a rather old one from Peco, but it's basically a step by step guide to beginning, all be it out dated, but still a lot of good tips! The only aspect I may have trouble with is being able to reach the back of the track on the upper level but I guess if I make my end to end detachable or even make the big square just a little away from the wall at that side, I could crawl under essentially. But I'll cover that during the planning stage! In terms of joining I'm just thinking that if I use PVA for the tracks, I can easily take some of the center ones away on the end to end to add in the rail pieces with switches on to then build the track into a riser to join the main oval. I mean I don't expect to finish this in a matter of weeks I hope I'm still doing it in years to come or atleast adding to it in years to come! But in any case thank you for the warm welcome gents, I hope to have conversations on here with many more enthusiasts until what would probably be described as the small hours of the morning! Hi Jordan - welcome to the forum, I was the same, had a layout as a child, gave up and restarted as an adult. Your scheme to build smaller projects that can be built up to create a larger layout is something that I have been preaching on here for a while, it allows you to see something completed before moving onto something else. luckymucklebackit wrote: Hi Jordan - welcome to the forum, I was the same, had a layout as a child, gave up and restarted as an adult. Your scheme to build smaller projects that can be built up to create a larger layout is something that I have been preaching on here for a while, it allows you to see something completed before moving onto something else. Yeah i figured if i get a small one done, even just the track, electrics and some scenery not the full shabang, like a backdrop etc, i can then feel accomplishment and also get used to the electrics. My ambition is to get setup with an Elink using DCC and railmaster on a PC. if i can master that on a small track i can then proceed to the bigger track. Daft question probably but with every "Oval" persay needing power, could you essentially set up a 16v DC electronic junction box with a line going to each "line" and then supply that junction box with the power needed? I was just thinking in my head how people did it with Elink and railmaster, as in supplied power to more than one line. Hi Jordan, welcome to the forum, something small then expand, very good idea. Start with something that you can bring to a reasonable running state fairly soon. There's nothing like seeing some trains running to spur you on to greater things. I'm always surprised when people build ALL of the boards, lay All of the track, put in ALL of the wiring then do ALL of the ballasting. I'd never stick it. I got the branch line terminus board as far as ballasting before I did more than lay some of the track on the next board, and pushed my way onward. There were some bits I went back and tweaked later but seeing a whole scene come together was very satisfying. Bufferstop wrote: Hi Jordan, welcome to the forum, something small then expand, very good idea. Start with something that you can bring to a reasonable running state fairly soon. There's nothing like seeing some trains running to spur you on to greater things. I'm always surprised when people build ALL of the boards, lay All of the track, put in ALL of the wiring then do ALL of the ballasting. I'd never stick it. I got the branch line terminus board as far as ballasting before I did more than lay some of the track on the next board, and pushed my way onward. There were some bits I went back and tweaked later but seeing a whole scene come together was very satisfying. That sounds great buddy. I can't wait to sink my teeth into it! Just need to measure and plan the attic properly to see what I can do with it. I think a lot of it would require sitting down but I'm all for that! Make sure that you can move around your loft in comfort, lack of headroom eventually drove me from mine, it was becoming a genuine pain in the neck. Sitting at the layout is ok providing there's enough clearance for your knees to go beneath it, otherwise your reach becomes too short. An adjustable (typist's) chair with castors needs to be on proper floor, not "loft boards" laid over the ceiling joists, if you want to avoid cracks in the plaster below. Bufferstop wrote: Make sure that you can move around your loft in comfort, lack of headroom eventually drove me from mine, it was becoming a genuine pain in the neck. Sitting at the layout is ok providing there's enough clearance for your knees to go beneath it, otherwise your reach becomes too short. An adjustable (typist's) chair with castors needs to be on proper floor, not "loft boards" laid over the ceiling joists, if you want to avoid cracks in the plaster below. Well my collection has started guys! let me say I'm well excited! 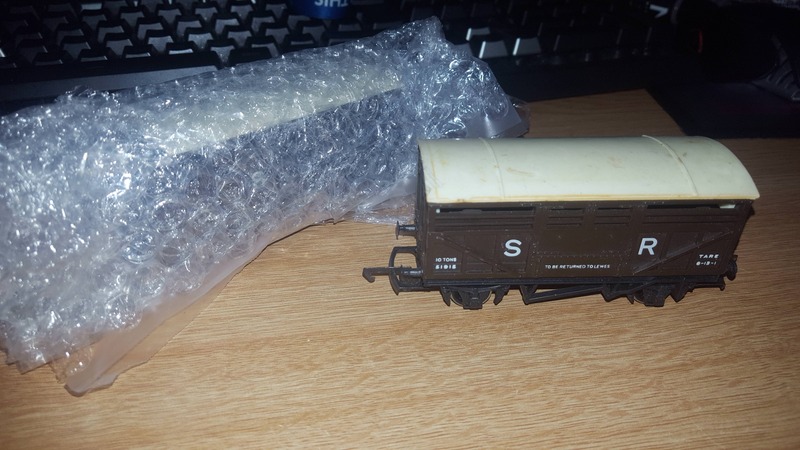 Got myself a Hornby DC set second hand off eBay for a very reasonable price which I am going to set up after work and take a proper look at. 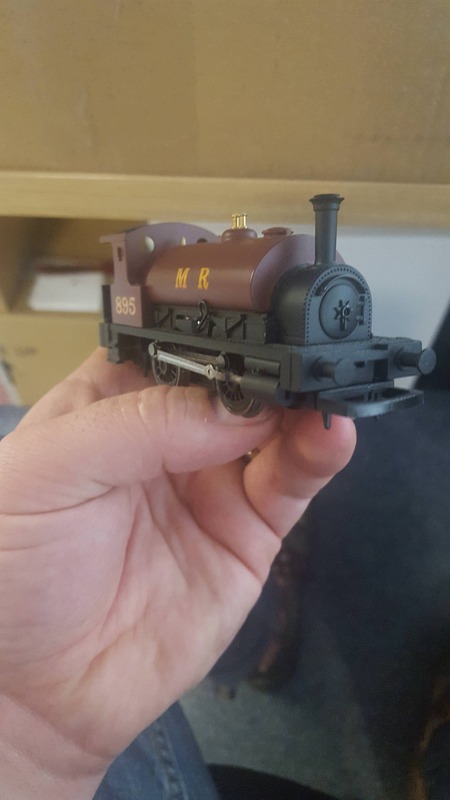 It requires a little bit of repair work but is in overall good condition at a Bargain of £33 including scenery, locomtive and 3 rolling stock! 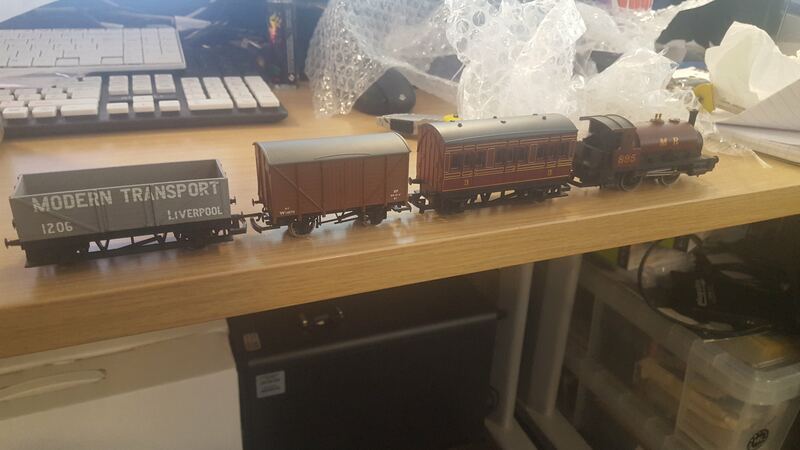 Then the Mrs bought me 2 more rolling stock in the form of cattle trucks! Not sure on the name of the loco but i do like it! Anyway, here is some pictures, i'll get some set pictures when im home later. If anyone know's the name of the loco, that would be fab so i can add it to my notes and my loco catalogue. It's an 0-4-0 (tank?) loco. 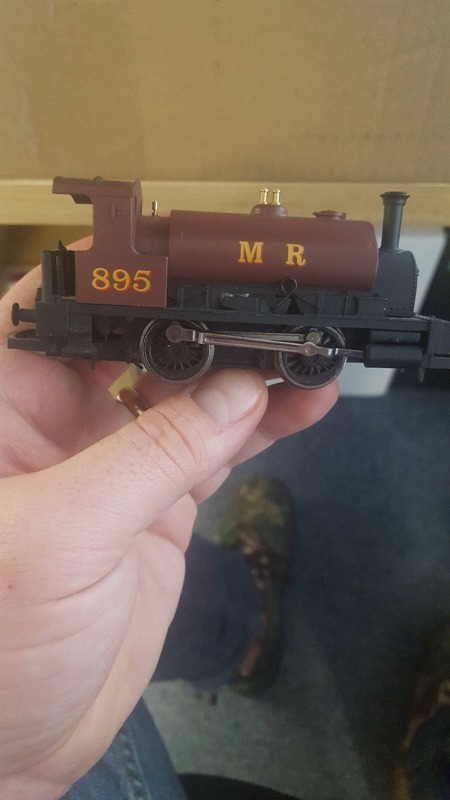 Not sure but perhaps the MR is for Manchester Railway(s)? Edit: Here's another style of 0-4-0 that I recently DCC'd, added figures and vacuum pipes. I used a 6 pin decoder plugged into a trailing harness that I soldered into the loco. 0-4-0 is the name for the wheel arrangment. 0 front bogie wheels - 4 main wheels - 0 trailing/rear bogie wheels. End2end wrote: It's an 0-4-0 (tank?) loco. Ah that looks well cool buddy and thank you for the information and the wheel arrangement information! I always wondered what that meant, so a 2-6-2 loco is 2 bogie fronts, 6 running wheels and 2 bogie rear?